Janesville native Maria Regan Gonzalez speaks during a campaign event in Richfield, Minnesota, recently. On Nov. 6, she was elected as Minnesota's first-ever Latina mayor. Every day after leaving St. Mary’s School in Janesville, Maria Regan Gonzalez would walk to her mother’s place of work, the YWCA, and help out by watching kids or cleaning. “Growing up as a kid, I saw my mom and dad extremely involved in our community, and they taught us the values of community service,” Regan Gonzalez said Wednesday in a telephone interview. She never considered politics for a career, but she said her parents’ example led her on a path to being elected mayor of Richfield, Minnesota, on Nov. 6. Her afternoons at the Janesville YWCA—located near the courthouse back then but now on the city’s south side—came at a time when the city was seeing an influx of Spanish speakers, many of whom looked to the YWCA for help. Her mother, Belem Regan Gonzalez, was the organization’s Hispanic outreach coordinator. “Of course I was inspired by my mom, who just works tirelessly in our community to help people get resources,” she said. Maria graduated from Craig High School in 2004. She had been involved in the Human Relations Club with an inspiring teacher, Santo Carfora. She was one of three members of the Gay-Straight Alliance and wrote a column about social and environmental issues for the school newspaper, she recalled. Volunteering “was just what I did. It was a part of my everyday life,” she said. Her classmates voted her most likely to change the world, and while she makes no claims to being on that track, she is dedicated to serving her constituents, many of whom come to her regularly because she looks like them and speaks their native language, she said. Regan Gonzalez graduated from the University of Minnesota with a degree in international relations and Spanish. 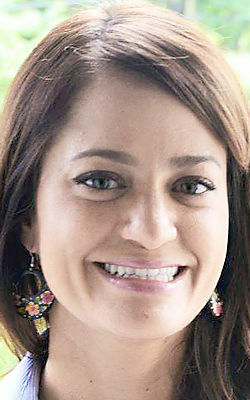 She eventually took a job with the city of Richfield, where she bought a house, helping connect residents with city services. She was struck by the opportunity to make change through local government, something she had known little about. When an opening on the city council came up two years ago, she ran against an established candidate, getting 57 percent of the vote. When nobody ran for mayor two years later, she was encouraged to run. She won without opposition. Regan Gonzalez will be a mayor in a city of 36,000 that is governed similarly to Janesville: A city manager runs the operations, while four council members and a mayor set policy and direction. The landlocked city has a school district in which 72 percent of students are people of color, she said. Richfield has been named the Twin Cities’ best suburb. It’s a hot real estate market with no vacant land, so re-development is common. Homeowners sometimes find their neighborhoods transformed by multi-unit rental housing, she said. Her full-time job is as a senior project manager for Blue Cross Blue Shield of Minnesota. She helps the insurance provider in its efforts to address the root of health-care needs in communities. She also is working on master’s degree in public health. Maria sees “huge inequities in who holds leadership in our state,” so she sees the election of a woman and the state’s first Latina mayor as a significant step forward. “One of things I love the most is going to schools and talking to kids and the way they glow, the way they get excited to know that somebody like me is the leader of our city,” she said. She said she feels a connection to the wave of women voted into public office around the country this fall, but as the winner of a nonpartisan election, she is glad she doesn’t have to stick to any party’s ideology.